The following list of eLibraries provides eBooks for the general collection: including nonfiction, fiction, classics, literature, and more. Digital text versions of classic literature with reviews from Amazon (txt & .lit). 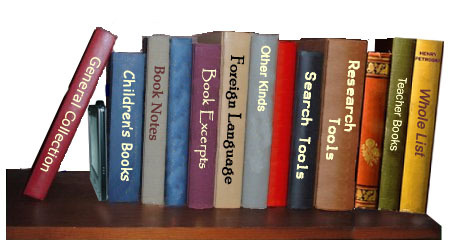 700+ SITES for CHILDREN covering Literature and Language many with complete stories. Free searchable e-books. Some classic literature, US Govt reports, legislative, legal, judicial & political documents. Requires registration & downloading the free askSam viewer software to use. Over 300 audio books (as MP3 file) available for free download. Some texts available as unabridged edition. Over 100 relatively new popular science fiction books in Reader, Palm, Rocket, and RTF. Classic books and resource/reference texts in html. Over 2000 texts of classic literature, book notes, references, and resources in html format. over 20,000 texts in a variety of formats: .lit, .html, .pds, etc. Mixing online book reading with discussion groups. Uses a three panel display for the text, the center panel shows the text, the side panels Talk and Mark,: Talk for conversation with other about the book; and Mark to take notes about the book. Book notes and over 1500 novels (HTML) available. Bookyards has over 14,000 books (PDF format) in a variety of topics. Noted science fiction author Steven Burst has released a Firefly novel under the Creative Commons license (PDF & Word). Great excerpt from Tom Brokaw's The Greatest Generation in Flash and audio (MP3). Including the World Fact Book with up to date information on every country in the world. Over 125 books in seven genres done in HTML page by page format. Classic books deliver in JAVA format with adjustable text structure, size, and color along with adjustable background and text (txt) formats. DailyLit delivers a small excerpt from the book of your choice by email on a daily basis until the book is finished. Good number of free books. Over five special collections from the Library of Congress, scanned books in two image sizes. 17 Dr. Who books in multiple formats. Over 1000 web books, including classic literature, philosophy, science, and history (HTML). Index site with links to" free e-books and more. In plain text, RTF, HTML, downloadable as zip files, or as PDFs. Over 100 classic works in HTML format (page by page). thousands of xml, html, Reader, and Palm texts. From the University of Washington. Collections include not just English, but also art, architecture, drama, fiction, poetry, history, political theory, cultural studies, philosophy, women's studies and music (HTML). Plays from classical through Modern (HTML). Site contains a collection of original plays and screenplays, criticism and links. A full digital public library for Florida Residents. A collection of over 35 classic books available for download as audio books (mp3 format or m4b audio book), books are either human narrated or are narrated using text to speech voices. FreeAudio.org is a non-partisan organization dedicated to the spread of liberty with MP3 files. Lots of books in both text and mp3 formats. has lots of public domain books in PDF and txt formats. Works (in HTML) of over 136 authors. As part of Harlequin’s 60th anniversary you can get 16 free romance novels from eHarlequin online. HarperCollins has a special feature on their website called "Browse Inside," an application allowing visitors to sample whole books from the list of HarperCollins titles online using a special flash display. Click on the Browse Inside link to access content. Over 500 titles in the general section and similar number in the children's section. Links to science fiction and fantasy books online. Links to online texts for American studies, including works from authors writing about America or American Literature. A small library of "supported text" books, books which have incorporated resources and reading/study strategies that help student learn more from what they read. Amazon does have free books for the Kindle reading device. Free audiobook collection done by human readers of public domain books in mp3 or ogg file formats. Over 45 audio eBooks of classic literature and poetry. Over 1900 full books and over 3000 short stories and poems by over 250 authors (HTML). An Online Library of Literature Classics in HTML chapter format. Over 300 public domain titles in HTML chapter format. Created by Cornell University Library, MOA is a digital library of primary sources in American social history (antebellum through reconstruction periods). This is a full text/image journal site of 22 magazines from 1830's to 1900's. More than 10,000 eBooks Palm, PocketPC, Zaurus, Rocketbook, or PDA in multiple formats, including versions for the iPod. ***Go to"WAP-enabled" mnybks.net (http://mnybks.net/) for free e-books for your mobile phone (cellphone). Wide variety of documents and book on various categories in Palm and other formats . eBooks for Nintendo DS device. Over 80 downloadable files, some with multiple books, mostly classics. Free downloadable physics text book. Links to over 1,500 eBooks in MS Reader (.lit) format along with MS resources including dictionaries. A great demonstration of a selected number of books from the Internet Archive, displaying how books can be shared on the internet. From Oxford University, this archive contains public domain texts from the on-line catalogue and may be downloaded (TXT, DOC, HTML, SGM, XML). about 400 books to be read online (html). Over 7,000 downloadable public domain e-books, classified alphabetically by author (in the Open Literature section). All files are in pdf format (standard or mobile versions for a small screen (more pages)). Exciting variety of newly created short stories matched with classics. Includes a Google map story, some Choose Your Own Adventures, a presentation story, a story told though twittter, and a simultaneous written story. A digital library of Greek & Latin texts (HTML). A collection of over forty leading classic novels (PDF) - one and two page layout versions. Over 60 popular classic novels in the PDF format. Classics library in Reader format. Oldest and largest online library usually .txt only. Approximately 300 classic texts in html, the site also can adjust the display for easier reading including visually disabled. Flash page turn versions of books written by non-professionals. There are also a number of audiobooks available. Has a children's book section. Thousands of books for students, teachers, and the classic enthusiast in HTML. E-reference library for programmers and IT. Contains components of many tech books. Easy to read and accessible books for beginning teenaged readers. Collection of over 18 eBooks world spanning travel books, containing the writings of travel writer Mark Moxon. Multiple formats. The million books project - content in English, Indian, and Chinese languages. Collection of audio books and stories read aloud by real people, available in low or high-bitrate MP3. over a 1000 classic texts usually in own reader format or HTML. A collection of free, open-content textbooks, including a collection of science and technology (HTML). A gopher tool containing text (.txt) versions of literary classics. Over10,000 online e-books, in HTML paged format. Each word is hyperlinked to a dictionary. The World Digital Library (WDL) makes available on the Internet, free of charge and in multilingual format, significant primary materials from countries and cultures around the world. WOWIO is a new kind of online bookstore that enables readers to download eBooks for free, using commercial sponsorships to compensate authors and publishers (free account required). EBooks available in PDF format. Over 27000 free eBooks in HTML format.